Reviews! Lots more have been added to the Set Review Library throughout the year, both of LEGO’s latest sets and a few classic too. Click the link above to see all our reviews, and if you’re interested in reviewing a set for TLCB get in touch – we’d love to add some more to the database! Interviews! The final interview in our Master MOCer series was published and last month we announced its replacement – Become a Lego Pro. The first Pro interview, with the Technic legend Sariel, is available here, and we have another in the can to be published early this year. Views! The magic One Million mark was surpassed in 2014! A huge thank you to every single one of you reading this, to those who’ve visited, those who’ve been publicised, and those who’ve commented during 2014. We really couldn’t do this without you! 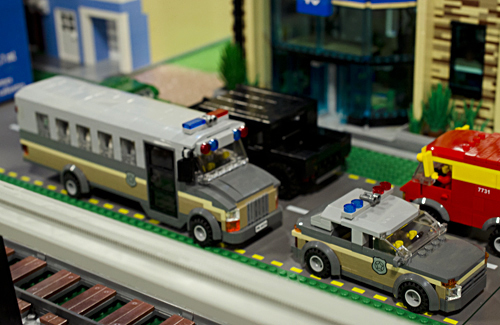 We hope to keep blogging throughout 2015, and if we manage it we’ll continue to bring you the best Lego vehicles, news and set reviews. We’ll also be publishing a few more Become a Pro interviews, and we might even run a building competition at some point too! 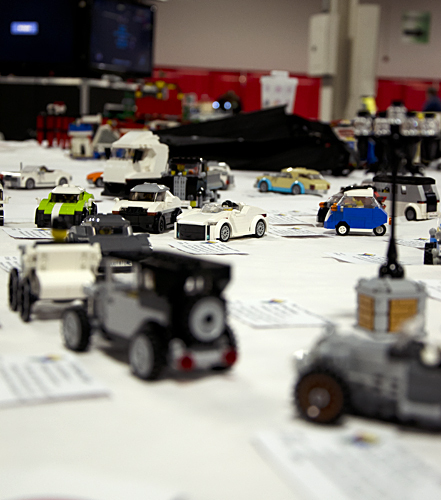 As always, you can let us know what you’d like to see via the Feedback & Submission Suggestions page, and you can contact us via Flickr – simply search for ‘The Lego Car Blog’ and send us a message. We love being an accessible blog (we try anyway!). If you’d like to take the step from reading about Lego to writing about it – and in doing so see your words published to almost a million readers a year – then add us on Flickr and send us a Flickr Mail with your article idea. This could be a set review, event review, interview, or something we’ve not though of – we want your imagination! Thank you from all of us here at TLCB Towers, and we hope you have a great 2015! In our recent review of the 42030 Technic Volvo loader set, a reader did make the very valid point that the newer, more elaborate flagship sets, while very nice, do cost rather more than they used to. Where was the equivalent of those ’80s supercar sets for a reasonable price ? Thomas, this is for you. 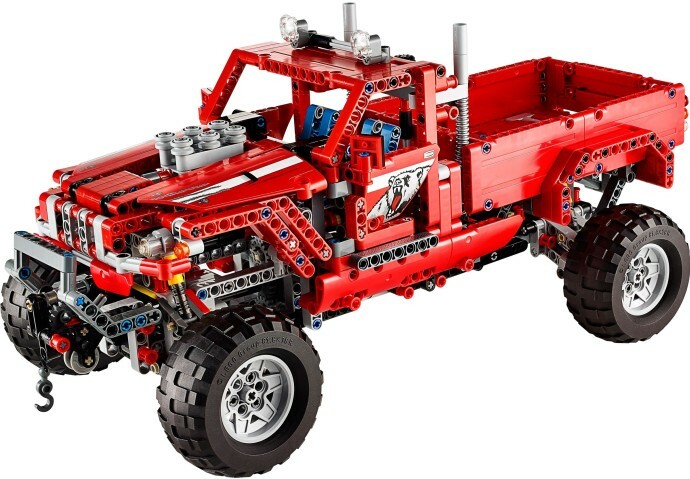 At £70 for 1063 pieces, it would seem that Lego has been listening with the recent 42029 Customized Pick-Up Truck set. With engine, steering, suspension, transmission (sort of..), a winch and a tipping truck bed this is at least as playable as, say, set 8860, the car chassis from 1980. That fine old stager cost $59 for 668 pieces way back then, equivalent to $167 in today’s money according to the office abacus. 42029 is $100, or less than half the price of the Volvo. First of all, the box is almost exactly the same size as 8860’s, and probably a good deal fuller. It’s simple and attractive in the modern Technic way, showing various different features of the Pick-up and the alternative plough / grabber crane B model. Moving on, it is a pity that 42030’s innovation of a single, large book isn’t continued here and, once again, there are no paper instructions for the B model. I’ll stop complaining now. For a bit. It’s a reasonably straightforward build, with some clever design and thoughtful touches to keep you entertained. There’s four of those excellent sliding Cardan joints here, as well as a quartet of the best springs for moccers – those yellow harder ones that are the same size as the old soft springs. And red panels. Lots of red panels. All good stuff, although I didn’t notice anything new here. Steering is by the usual hand-of-god gear behind the cab. It feels a little loose and the lock is just OK, but it works. The in-cab wheel is not connected, and it’s not angled, leaving it looking too low and not quite right. A note for moccers – if you make a fantastic looking car and bung the ‘wheel in dead straight and too low it RUINS it. Fact. For a reasonably priced set it’s forgivable however. Just. Suspension is pretty impressive. Independent all round, with one hard spring per corner, it feels perfect in stiffness and travel; and a good deal better than what’s underneath most real vehicles of this type… The double wishbone design is very robust and capable. This passes the drop test! TLCB will not be liable for any breakages that occur when you chuck it down the stairs, however. The transmission has nothing to do with changing engine speed relative to the wheels – instead the lever between the seats can toggle between drive from the gear on the side being sent to the winch or the tipper mechanism. There’s a secondary control just inside the door where it’s easier to reach, but I do love the fact that the ‘gearlever’ moves as well. The tipping bed works via a single small linear actuator that you’d swear wouldn’t be man enough, but it is. A little wobbly, yes, and it does only go up about 45 degrees, but it can take some weight in the back. And hooray! for the fully lined bed; there are no holes left unplated and the tailgate will flop down. Very good. Also good is the winch. It does what it says on the tin. The transmission that sends drive to it and the tipper is easy to motorize as well, although it’s a lot less necessary than it is on 42024, the Skip Lorry. The gearing for the manual control seems about right. Inside, there’s not much to see. There’s the aforementioned vertical steering wheel, the gearlever and a pair of too-small seats. That’s pretty much it, although it’s good that the door mirrors are attached to the (opening) doors. I really like the look of the B model. 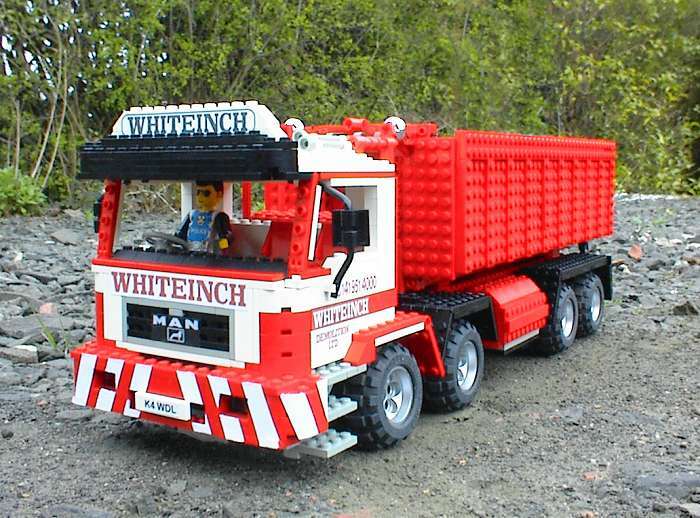 It’s an articulated plough / grabber truck thingy that looks like a fun build with a versatile result. I haven’t built it yet but the signs are good. So. A Supercar replacement on a budget ? I’d say yes – it’s not better than 8860 but it is better value. 8/10. It should suit most Technic building petrolheads, including TLCB’s good friend Thomas. It’s that time of year again! Yes Christmassy snow might be falling here at TLCB* but the big news is that the amazing Henrik Hoexbroe has released his annual ‘Mega MOC’ for 2014! Featuring 15 liveried racing cars, another 10 assorted racetrack vehicles and 100 mini-figures, Henrik has recreated the world famous Le Mans 24 Hour race in beautiful detail. He’s timed it well too, as Toyota have just wrapped up the 2014 World Endurance Championship (of which Le Mans is the star event). Henrik’s pit-straight scene leaves out the championship winning Toyota TS040 and its mighty fellow LMP1 prototype racers in lieu of the more recognisable stuff that makes up the bulk of the Le Mans field; the GT Pro and GT Am classes, including cars from Porsche, Aston Martin, Ferrari and Chevrolet. What we like best is that – whilst we do admire creations of incredible intricacy and fragile realism – Henrik’s scene is constructed in a robust mini-figure friendly way, and looks like it could happily survive a child’s hands without too much damage. And that, surely, is what LEGO is all about. 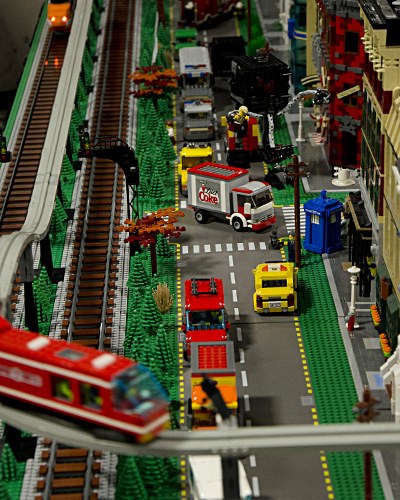 You can see more of Henrik’s fantastic Le Mans scene, including close ups of all the racing cars and other vehicles, on both MOCpages and Flickr. It’s well worth your click. *Unless you’re reading this via the Archives or from Google, in which case why weren’t here sooner?! Sign up to TLCB using the subscribe button at the foot of the page and you’ll receive timely updates for free. Thumping onto the doormat at the TLCB Portakabin this week, has been a copy of his second Lego Technic book. 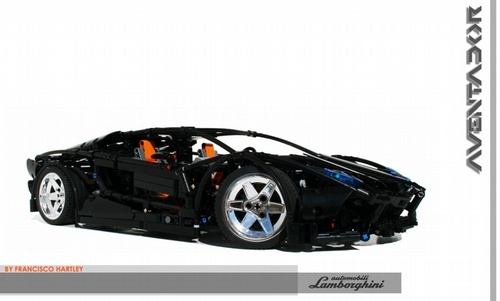 It’s called Incredible Lego Technic and it’s clearly intended to show us just how incredible Lego Technic can be. 36 different builders, most of whom have graced these hallowed halls before, show you how. 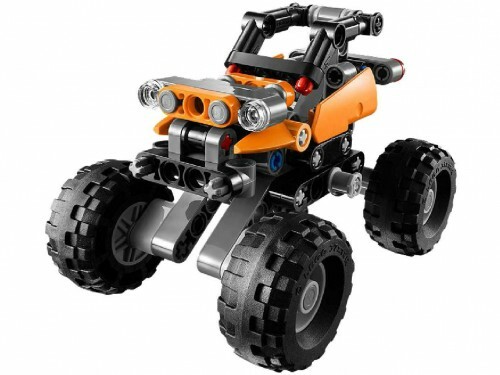 It showcases more than 70 of the very best Technic models out there and it’s designed to inspire. It does. Running to 280 pages and printed on thick, glossy paper, it gives each model 2-4 pages of very high quality photographs, some accompanying text that gives details of the models’ various functions and a bit of background info about the prototypes. It’s a lot like flicking through the greatest hits of MOCpages, in a parallel universe where the photo resolution is high, and everyone presents their models faultlessly. And there’s no-one saying ‘come an chek out mi awsum tuner’…. although to be fair, that doesn’t seem to happen as much as it used to. Anyhoo, this makes it the best kind of coffee table book; one you can dip into when the mood takes and probably refer back to many times when looking for inspiration. There are no instructions or building tips here (Sariel covered that in his previous book) but experienced builders will find the diagrams that highlight the motors and gears on a lot of the models quite helpful. Brilliance on this scale doesn’t date. It’s motorized as well, using old 9V motors to do everything the real thing does. Impressive stuff and all the better for showing da studs. There’s a lot more than cars and trucks here, with Aircraft, Watercraft and Farm and Construction equipment represented also, as well as half a dozen real oddballs that show amazing ingenuity – buy it and find out what they are! Incredible Lego Technic is published by No Starch Press, and will be available from Amazon in the next week or so as I write. It’s fairly expensive at $29.95 (US) but you are definitely getting what you pay for. Hi! I’m Chris, and I’m honored to be back again guest-blogging for TLCB! 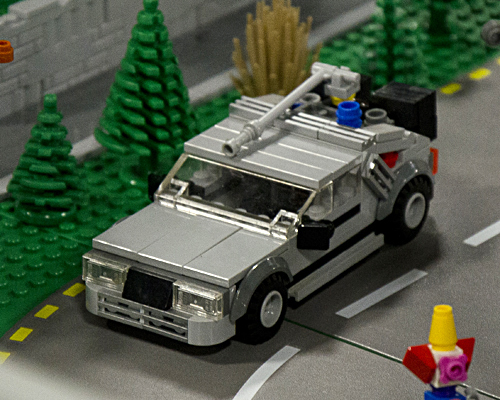 Today I’m writing a recap of Brickfair New Jersey 2014 from the perspective of a car guy. 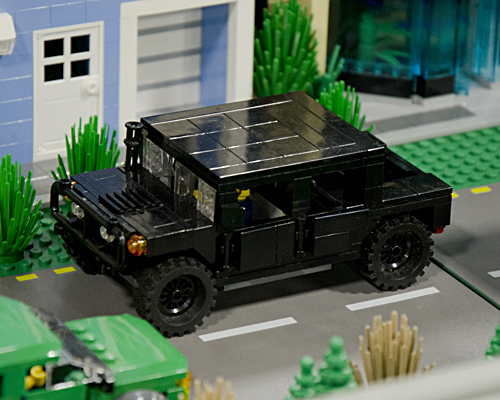 Brickfair NJ is a relatively large event, and in 2014 there were several really good vehicle displays to be enjoyed by the car connoisseur. First, I should probably disclose that I was there displaying as well! 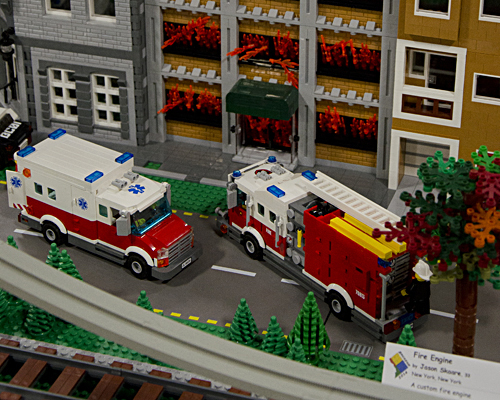 If you’re interested, you can find me on Flickr for more of my work with minifig-scale cars. Creations for Charity 2014 is here! The amazing annual charity event Creations for Charity is here for 2014! Over the coming weeks some of the best builders in the Lego Community will be donating their own creations that you can bid to own! All the proceeds from the sale of these creations go towards funding a huge* stash of LEGO toys that are distributed to children in need around the world. How cool is that! You can help this incredible initiative in a number of ways; by publicising Creations for Charity, donating a creation, or bidding on one of the awesome creations available in the auction. Donations open today – if you’d like to give away one of your creations that you think could raise money for children who have nothing then get in contact with the Creations for Charity team, they’d love to hear from you! The Creations for Charity 2014 store opens on October the 15th, so check in regularly to see what’s available and get ready to bid! 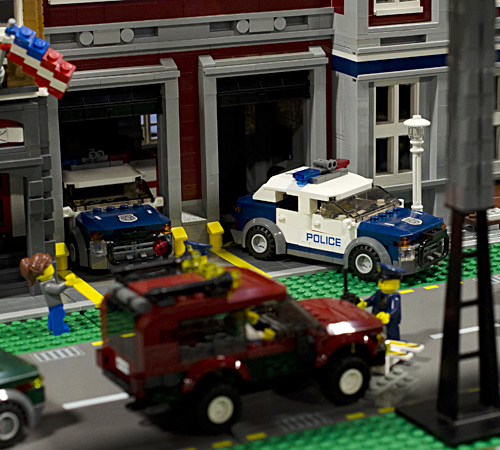 *Over $20,000 worth of LEGO was distributed to children in need across three countries in 2013! When Christopher Nolan reloaded the tired Batman franchise back in 2005 his critically-acclaimed Dark Knight trilogy created new icons in cinema history. The late Heath Ledger will probably best be remembered for his spectacular performance as the Joker, and Batman’s new (completely real, drivable and road-legal) wheels blew away anything that had been seen before. To be revealed at Comic-Con this week, LEGO has immortalised both Ledger and the Tumbler in brick form, with the incredible 76023 Ultimate Collector Series Tumbler. Measuring over 15 inches long and 9 inches wide the Tumbler features 1,869 pieces – including both Batman and Heath-Ledger-Joker mini-figures – as well as the usual UCS fact sheet. Expect 76023 to retail for around $199 when it reaches stores in September of this year. We can’t wait! We’ve blogged quite a few classic vehicles here at The Lego Car Blog recently, so to bring a bit of balance we’d like to post a duo of cars so newly-released we’ve not even seen them on the road yet. Luckily though, the Elves rediscovered the page of our very promising Featured TFOL Alexander Paschoaletto, and his two latest cars; the 2014 Lamborghini Huracán, and the 2014 Subaru WRX STI*. Making modern cars is getting harder, with lots of curves and angles appearing on everything from city runabouts to limited-run exotica, but Alexander has managed to pull off the curves found on these two nicely. See more of both creations via the links to Alexander’s pages. *Our American readers may think the Subaru should read ‘2015’. Our marketing department refuses to time travel. …or the Elves go Technic. Regular readers of this blog will remember that the Elves have “helped” us to build some of sets that we have reviewed, including some of the 3-in-1 Creator series. We decided that it was time to let them go solo with the smallest, cheapest Lego set that we have ever reviewed (we have to buy this stuff you know!). After the usual explosive opening of the two bags of parts in this set, we helped the Elves to gather the pieces up into a pile and then realised that there were no tyres. These are packed loose in the box and had all rolled under The Lego Car Blog executive beer fridge and champagne chiller. Fortunately a skinny Elf fitted under the fridge. He was soon forced into the gap by his colleagues poking him with the axles from the kit. He reappeared a few seconds later with all four tyres and a Malteser that had rolled under there two months ago. The Elves then set to work on book one of the two instruction books that come with the kit. “What?!? !” we hear you cry, “Two instruction books for a set with just 100 pieces?”. LEGO have come up with a new concept for this model. The first booklet builds a common chassis and then the second booklet has instructions for two alternative bodies to fit onto the chassis. A novel, fun concept, with lots of play and re-building potential. The instructions are in the usual clear, LEGO format, with just a couple of parts per stage. 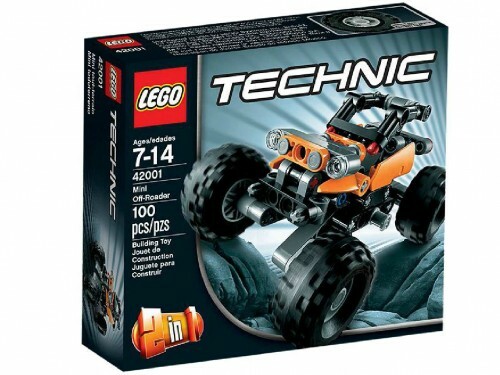 This is slow for a Technic set but remember the starting age for this kit is just 7 years old. By stage 6, a 5-wide frame has taken shape, with swing arms for each wheel. The Elves had to resist the temptation to bash each part down hard and tight, so that the suspension would work on the finished buggy. The first Elf-fight broke out at stage 8, with the adding of the two elastic bands which make the “springs” of the suspension. The temptation to flick the bands at each other was too great to resist and order was only restored when both bands had vanished under the beer fridge. Annoyingly, for a set aimed at kids, LEGO provide the usual spares for some of the smaller, cheaper parts but don’t give you a spare elastic band. The skinny Elf was sent under the fridge again and this time returned with the elastic bands and something blue and furry: possibly left-over cheese nibble from the office Christmas party. The last stage of the instructions is to turn the chassis the right way up, though even the Elves didn’t really need a page of instructions for this. The first body quickly builds up in typical Technic style, with some 1×1 round trans plates for front and rear lights. Stages 3 & 4 have a bit where you have to do things in the right order or pieces won’t connect but that’s the trickiest part of the build. Stage 12 requires strong fingers to insert a 2 stud-long axle and we had to do this for the Elves. After 22 short stages the Elves were left with a nice-looking, orange and grey, short-wheelbase off-roader. It rolls across carpets and desks and its long-travel suspension bounces really well. There’s space inside for a few of the smaller Elves and they had great fun zooming around the office until two of them were car-sick into the jacuzzi (again!). …Well, what else was I gonna call it …? 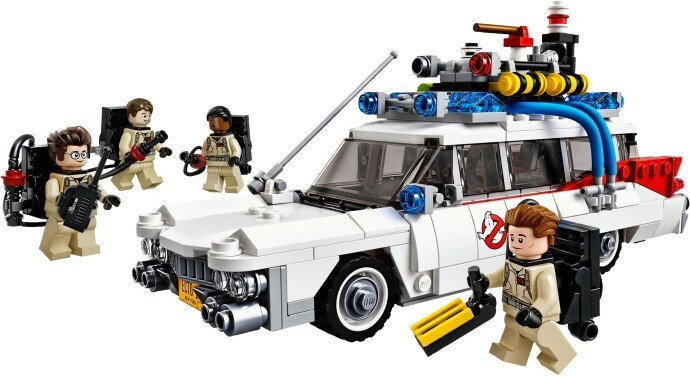 Welcome to the TLCB review of the new Lego Ideas 21108 Ghostbusters Ecto-1 set. I was in my early teens when this brilliant film was released, and I have fond memories of it. It was pleasing to find on seeing it recently that it’s aged quite well. Unlike some of it’s audience… and of course that 1959 Cadillac ambulance still looks effortlessly cool. Turns out it looks cool in Lego as well. This was always gonna be a day 1 purchase – I knew that as soon as I saw the preview pictures. Unlike the DeLorean model, Lego has stayed very close to the original designer’s idea, making it the most realistic minifig scale car I’ve seen from them by a long way. You have to pay for this excellence. Forty five smackers is a lot for an 8-wide car, however you look at it, although as we’ll see, Lego have done their very best to make the outlay worth it. Instructions are a similarly high quality square-bound book with glossy pages, lots of interesting snippets about the film, the characters and the car, and the instructions themselves are interspersed with quotes from the movie to enjoy as you build. Take your time over it. It’s like doing an Architecture set, where you’re learning about the building as you, er.. build. The only thing that might annoy is the book’s inability to lie flat; but what are paperweights for ? It’s quite rare for me to be remotely interested in a set’s Minifigs, so I’m no expert on such things… The four main characters do seem to be a pretty good representation of Venkman, Stantz, Spengler and Zeddemore. I have seen comments elsewhere about Venkman’s hair not being right but it looks fine to me. I told you I was no expert… I like the way his sardonic features do a passable impersonation of Bill Murray though. All of the heads are printed on both sides, to provide a scared face when the situation arises, which it will… The four all wear identical torsos with their initials printed thereon, which you’ll need a magnifying glass to read, but it’s a nice touch. They also have identical backpacks, well greebled with all their ghostbusting gear, and Zeddemore has his, er his…. ectomplasmic activity sensor thingy as well. All in all, these are excellent. Probably. The meat of the build is, of course, the car. A white ’59 Caddy ambulance fully equipped for any paranormal emergencies. Building it serves as an object lesson in how to form a perfectly shaped minifig scale car. Lesson one: you’ll need a lot of brackets. Lots and lots. Those new 2 stud long curved slope pieces will come in pretty handy as well… Anyone used to just building City style cars is in for a surprise: this is building at the very top level of moc quality, and it shows in the finished article. It’s scaled properly to the wheels, it’s stance and proportions are spot on, the level of detail is right for it’s size (the only thing really missing is door handles; but then I can’t think of anything that wouldn’t look clunky – that’s one of those things that’s better left out, I think), even the side windows have the correct ‘tumblehome’ and trimmed edges. All extremely impressive in a model this small, although that does mean that nothing opens. Fortunately, the roof with all it’s… stuff comes off for playability. Three figs will fit inside (someone’s gonna have to walk, unless he wants to lie down in the back…). For such an intricate model, it’s surprisingly sturdy too. One of the reasons it looks as good as it does is the use of silvered pieces for the bumpers, for that typically Cadillac chrometastic look. If they’d have stretched to silvered instead of grey pieces around the windows as well it would look fantastic. And be even more expensive… Another bonus is the fact that there are no stickers (Hallelujah! ); everything that needs to be is printed, including four 2×2 curved slopes with the Ghostbusters logo and the ECTO-1 licence plates. This is a model that screams quality. It probably wasn’t subject to the same cost constraints that may have hobbled the (cheaper, worse) DeLorean; and I’m glad that a lesson may have been learned. Collectors will pay for quality, and this is very much a display set; one to perch proudly on your mantelpiece and await the ‘wow’s from visitors. Or pose it atop your television and sit back to enjoy the film…It’s better value in the US ($50) but even in Europe, it’s worth the price of admission. 10/10. Today is a Big News Day! 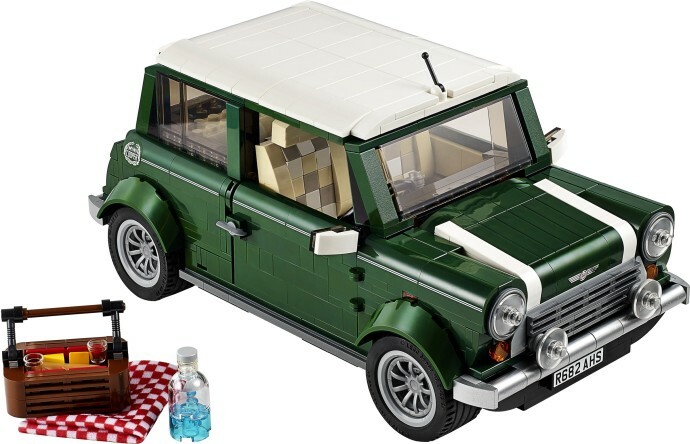 After much secrecy we can reveal the newest addition to LEGO’s Expert Creator line; 10242 Mini Cooper! • Features opening doors, hood and trunk, spare wheel in separate compartment, detailed engine and 2 fog lights. • Accessories include a picnic basket, bottle and blanket for nostalgic picnic theme. • Authentic replica of the MINI Cooper Mk VII. • Classic green and white color theme with white wing mirrors and racing stripes. • Lift the hood to reveal the detailed engine. • Remove the roof and access the detailed interior. • Go on a countryside picnic with this iconic classic! • MINI Cooper measures over 4” (11cm) high, 9” (25cm) long and 5” (14cm) wide. US $99.99 – CA $119.99 – AU $149.99 – DE 89.99€ – UK £74.99 – DK 799.00 DKK *Euro pricing varies by country. 10242 will reach stores over the summer (or the next few months for those of you around the world), aimed at experienced builders and featuring over 1000 LEGO pieces. Hopefully we’ll see a few British Racing Green creations appearing shortly after release! It’s the opening weekend of the 2014 Formula 1 World Championship in Melbourne, and the Elves are riotously excited. So what’s this Technic crane truck by Eurobricks’ Razor got to do with F1? Well, it’s the first race weekend under the new regulations with new engines, new hybrid systems, new cooling, new exhausts and new downforce. All of this means new reliability problems, and therefore we expect to see quite a few F1 cars being parked during the race. The Melbourne track is largely on public roads, so crane trucks such as this one are vital in removing broken cars from the side of the track to safety. Razor’s Technic version is powered by nine(!) Power Functions motors, with three battery boxes and four sets of lights. To see it in action and join the discussion head over to the Eurobricks forum via the link above. Back to our tenuous F1 link; you might see more of crane trucks like this than the Renault-powered cars at Melbourne this weekend… We can’t wait!